cellnet305 has no other items for sale. 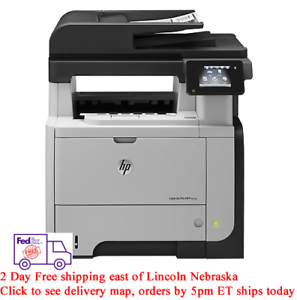 HP Laserjet Pro M521dn is a handy Laser All-In-One Printer delivering crisp and detailed images and files. The 42 ppm printing speed provided by this black & white model makes it easy to complete any printing jobs with efficiency. In addition, it is capable to network with various devices. Sales tax may apply when shipping to: AS (3.0%), IA*, MN*, WA*. Very good deal great product fast shipping! Great seller. Super fast ship. Exactly as described. Printing is excellent in quality and speed. Scanning is fast too. Most of all, I like the feature of its wifi connectivity. I thought I couldn't print or scan wirelessly with this printer unless I buy a wireless printer server. I was wrong, fortunately. I connected this printer to my network router then everything goes wirelessly. I am completely satisfies with this printer. Being web connected is awesome! I email myself scans and it has access to tons of online content, like coloring pages for kids, mazes, news. Excuses to waste toner, perhaps, but very cool! We use it to replicate the BIG machine at our office so we can work from home. Does everything...fax, scan, email, fast copies...looks great. Bought to replace a smaller unit to increase speed and ease of use. I fit the bill for that purpose.